Our new webshop is now open! At launch we are selling our traditional cider vinegars as well cider infused oak chips for use on smoking bbq’s. Hopefully later this week we will also be offering a limited number of Llanblethian Orchards T-Shirts on the site. Further ahead we aim to start offering our ciders and perries directly from our website once we have a premises licence so do check back from time to time. 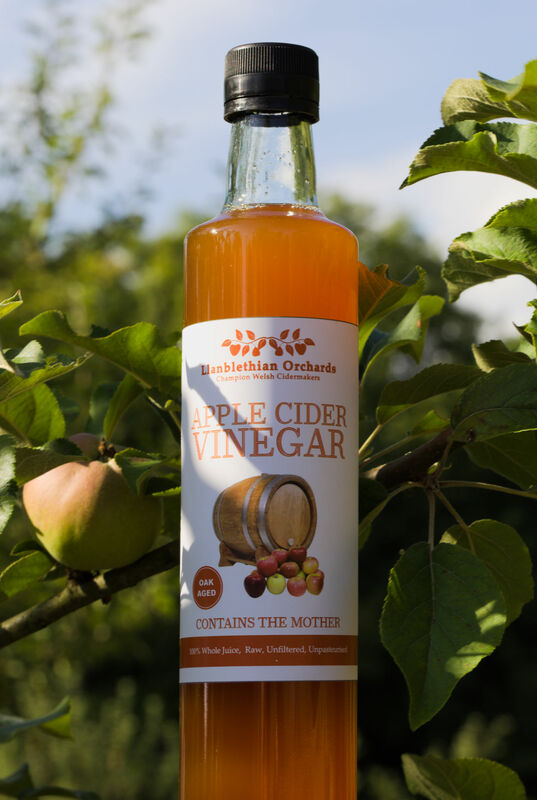 Traditional apple cider vinegar made with time honoured traditions.Our cider vinegar is made with traditional cider apple varieties picked from unsprayed orchards.We first mill and press the cider apples into juice. We then check the sugar and acidity contect of the juice and correct if needed. Next we allow wild yeasts in the environment to ferment the juice slowly over six months into cider.Afterwards we rack the cider into our vinegar house and add our wild mother culture to the cider. The cider is then left for six months to a year to slowly turn into vinegar and matured on oak. 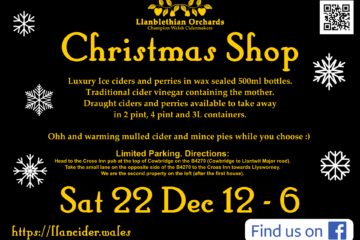 We’re also delighted to announce you can now purchase our cider vinegar and oak chips while in Cowbridge Town itself. My parents’ design business Ctronix Ltd established in 1979 and based at New Druids, 41 Eastgate (the three story cream building with the large raised flower bed in front) has a stock of our vinegars and oak chips and if you are passing you can pop in and purchase them between 10am and 1pm Mon – Thurs (cash only). If you do have any issues with our shop or any suggestions how we can improve it do please get in touch, we’d love to hear from you!